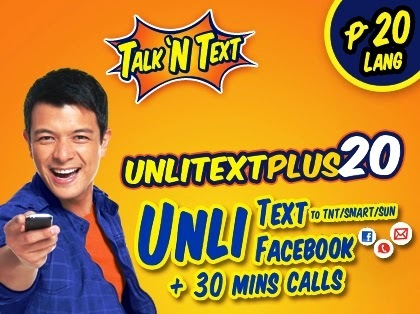 Talk N Text latest promo the unli txt plus 20, this promo has 2 days unlimited text to SUN/SMART/TNT, 2 days unlimited Facebook access, and 30 minutes of call to SMART/SUN/TNT all this for only Php20.00 and guess what, you can extend it for 1 day by texting EXTRA to 4545 for only Php5.00, to register to TP20 just follow the instructions below. How to call: Kindly refer to your confirmation message upon registration, because dial prefix may vary per area. Kaya register na sa Talk N Text UNLITEXTPLUS20, may unli text kana may unli Facebook kapa, at meron pang dagdag na 30 minutes pantawag para sa buong barkada. Sulit na sulit talaga sa Talk N Text KaTropa.